We're The Millers, an English movie, is not currently screening in Hyderabad. When a Hollywood comedy boasts of Jennifer Aniston and Jason Sudeikis in the lead roles, you can bet that it will contain enough irreverence to make you chuckle. After all, these two actors have done their share of films that take concentrate on cheekiness and mockery. 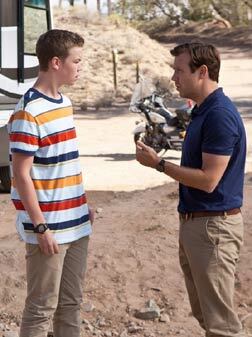 We're The Millers does not disappoint in that particular department, but it a tame attempt to portray an unconventional American "family" that is brought together due to various circumstances. fullhyd.com has 700,000+ monthly visits. Tell Hyderabad what you feel about We're The Millers, and then also see all user reviews for We're The Millers!